The transfer of paintings has been made... 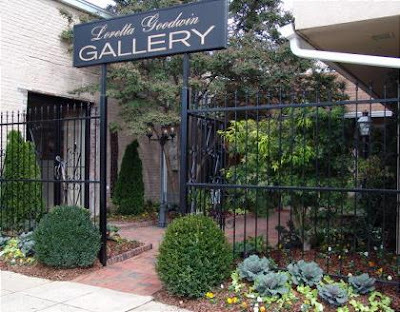 I'm officially represented by Loretta Goodwin Gallery and NorDys Gallery is no more. Nancy Dyson was absolutely tops as a gallery owner/director; professional, welcoming and very respectful of her artists in every way. I have no doubt that the new (to me) gallery will be just as friendly and just as professional and I'm delighted that their familiarity with my work opened that door for me and allowed an easy transition. But it still hurts to hear the echos in the former grand space, watch the new occupants 'case the joint' and realize that I was one of the first to bring paintings into it... and one of the last to remove them. Only a few works remain as Nancy loads and hauls them back to owners around the Southeast. What a trooper! Back in 2001 we were putting our house in New Orleans on the market and preparing to move to Birmingham to be near "the kid that needed us most," our single-mom daughter who was preparing to adopt her second child from China. Alabama had been home to us for ten years prior to our fifteen years in New Orleans, so it was almost like coming home. At this same time, NorDys, in Birmingham, was searching the Internet for potential artists for her new gallery and we connected. I stopped by the gallery on one of our house hunting trips to B'ham. They were still in the throes of painting and preparing for their grand opening. I fell in love with the huge space and recognized the potential of both gallery and owner immediately. I signed on, happy to have a new 'home' gallery without the hassle of the hunt. It's been a rewarding seven year run. You will do very well, Karen! I am sure your new gallery already knows that, however. It is amazing how the web of life works...you never know when things will come around again. I'm sorry things didn't work out for NorDys for whatever reason. It was a gorgeous gallery. However, I know your work will greatly enhance the new one, and that there will be many shared successes! Wishing you success at the new gallery.